In a large mixing bowl, well combine everything from Sponge's section with a mixing spoon. Cover, and let it ferment until more than double in volume. Combine the sponge with the flour and salt ... if your dough needs water more likely because you didn't let the sponge ferment enough, anyway, add water. Knead until the dough smooth and elastic. Let it rise in 85F room until it double in volume. Divide it into six (or seven) portions. Use your hand (no rolling pin!) to stretch the dough to your desire thickness, add topping(s), and bake in 475F oven (preheat for half an hour at least with a baking stone in) until it turns golden brown. The dough can be frozen... from step 2, after finishing the kneading, wrap well, freeze. When you want to use it, thaw (covered) and let it rise according to the spec. Very good advice... if it ain't broke, don't fix it! That's simply perfect Gattina!! You can almost taste it--and I wish I could. 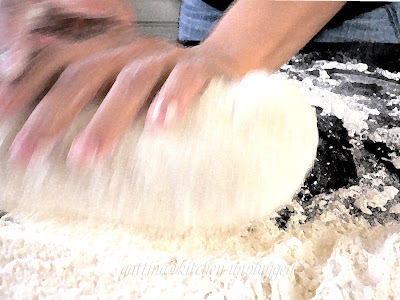 I love the photo of you kneading the dough. That really captures what it is to make bread--to love making it! The thin crisp crust is to die for! I love Pizza, and yours is looking so crispy and nice in color. You are true - any recipe is not perfect until we try it, get used to it by our experience. for me it always depends on my mood :) . I think you're right, once you find a recipe that you like you should just use it and work at it to perfect your technique and flow :) Beautiful pictures, as always! I love seeing your hands kneading the dough. It really shows us how much you're connected to the food you make. Ang, I've tried quite a few recipes, this one suits my schedule (besides of its better taste), but please plan accordingly as there are two rising time. Angie, I'm fine with either thin or thick crust (like silician pizza), the real thing I'd die for is the unique flavor which can only be done by wood oven... I dream to have one when we have our own house, hehee. Pat, Once you told me how you enjoy making bread (and by hand), I feel we connected right away!!! Thanks for your sweet comment darling! Asha, you're a great cook/baker, I'm sure your pizza will be terrific!!! Between you and Ellie - I've got multiple recipes to try and so much inspiration! I like your idea of perfection! Isn't it interesting that so many of us foodie bloggers lust after all these great cookbooks. Do you think it's because we many have totally or even only partially missed out on cooking with all the family women when we were little. It gives you pause when you think about cooking with your own children. It is extra work. You are oh so right about working with a recipe more than once and how even something as extraneous as the cook's mood or the humidity can change things. Lovely looking pizza my girl. Very good advice Gattina, whenever I post a recipe I am afraid, what if it doesn't turn out right for who is making it. When I am familiar with a dish, like in my case "my kind of Indian food", I know how it should look like, smell, feel but someone who is new to that cuisine won't have those instincts to fall back on. So only by trying several times can it be achieved. Wow! A pizza dough.. now I want to see what all u cook up with it.U are right abt getting it right by trial and error. Nothing else is fool proof. Gattina, I'm quite busy nowadays so I quickly read thru but seldom post. Tho' my blog has finally 'hoi cheong', hehe. Hi--I tried your recipe for pizza dough the other night, and my partner agreed, this was the best I ever made. The sponge idea is a good one, adds more flavor and provides better texture, and the salt portion was just right (too often pizza dough recipes are under-salted for my taste). The only thing I did wrong was to only divide the dough in two, so it the crust was too bread-y. (Next time I will divide by four). But hey, it was delicious bread, so thanks! Hi Gattina - nice photos! Am a bit of a novice with pizza dough, and am trying your recipe now...how long do you leave the sponge sit before you add the rest of the flour and the salt? Also - do you cover it with a towel so it can still breathe, or with saran wrap? 1. For how long it really depends the weather, even rising in room temperary (ideal is 75F to 85F... the reading follows Amercian system). Summer and winter there will be a big difference. For me, in summer in the city I lived, it took me about 2 hours. In winter can be 4 hours (my house didn't have a very good heating system). So please use your eye to judge instead of the clock. 2. Yes :) I always prefer cling wrap (guess same as saran wrap?). This recipe will yield quite many pizza dough (as my family loves eating many). Since it is your first try, may I suggest you halve the recipe? Happy baking! why is it not crispy, when i bake the pizza dough??? For a crispy crust, try a pizza screen instead of a pan or a stone, as Gattina said a stone needs to be heated in the oven for some time before using it to bake a pizza on, a screen is a good alternative, at least I prefer it so I don't have to have the oven on so long. Gattina, I just found this blog today and I'm just blown away by the recipes. Thanks for talking about making the same recipe repeatedly until getting it right, I became obsessed with pizza a few years ago and I made a lot of bad pizza before finding a good NY crust that I just love, but I'm going to try yours next week. (I make my dough on 3 or 4 days in advance and it sits in the fridge getting bigger and yummier).